With so many consumers out there looking for a quick burst of energy — whether it be in shot form, a pill, or a drink like Monster or Red Bull — it was only a matter of time before the vaping industry jumped on the energy bandwagon. Not surprisingly, some manufacturers are adding caffeine to their liquids or producing cigalikes with the sole purpose of allowing you to vape your daily dose of caffeine. Seems great right? Well… depending on how you look at it, vaping caffeine is a either revolutionary idea, or a potentially dangerous one. We already know about the possible downsides of high caffeine intake from the energy drink industry. Stories about people consuming mass amounts of these beverages, sometimes with life-altering and life-threatening effects, seem all too common. Take for example the most recent headline of overuse: a 28-year old UK mother of three, who nearly lost her vision from drinking dozens of Red Bulls per day; or news of a study that showed a link between energy drink use and cardiac arrest, even in healthy young people with no history of heart disease. It’s stories like these that concerned me when I first found out that companies are trying to bring the energy drink craze to the vaping world. We’re already in an environment where critics are looking for anything to prove that the vaping industry is BAD. Do we really need the additional criticism? Eagle Energy Vapor’s disposable e-cigarette is one of these new products, and products like it are sure to start popping up in gas stations and convenience stores around the country. It has three major ingredients: guarana extract (pure caffeine), taurine, and ginseng. It’s essentially a Red Bull energy drink in vapor form. About 2mg of caffeine is delivered per puff, with about 10-20 puffs equivalent to the effect of a cup of coffee. Unlike energy drinks though, vapor is inhaled, which speeds up the delivery of whatever ingredients are present. When someone drinks a cup of coffee or any caffeine-infused drink, it has to be digested before the drug reaches the bloodstream; slowing down the absorption process. But vaping caffeine sends it straight to the lungs and into the blood. This also means you need less of it to get the same stimulative effects as digestion. Does vaping caffeine work? Apparently so: earlier in August staffers at the Huffington Post passed one around and saw varying levels of effectiveness based on their individual caffeine sensitivities. This is where my problem comes in: at least anecdotally, caffeine seems to have a wider range of sensitivity among humans than nicotine does. This means that one person may need 20 caffeine-infused puffs to get an effective buzz, but the next may need only five. With inhalation being such an effective delivery method, there’s no telling how your body might handle it, and extra precaution is sure to be necessary to avoid the negative side effects. In addition, nicotine can be adjusted up or down in e-cigarettes, but so far the caffeine is only provided at a fixed level. 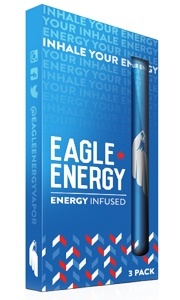 Eagle Energy is not the first vape manufacturer to come out with caffeine-infused vaping products. A few e-juice manufacturers have had caffeinated e-juice available for quite some time. 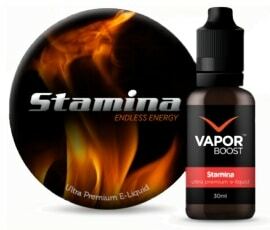 Vapor Boost’s Stamina e-liquid includes not only caffeine but nicotine too if you select it, and there’s a host of others, including Lizard Juice’s Red Lizard, Energy Shisa’s Caffeine Vape, and Vitamin Smoke’s Acai Berry and Mocha Coffee. Vapor Boost even sells an Energy Boost E-Liquid Enhancer to add to your own standard e-juice. What is a little bit troubling, though, is the fact that not every company provides guidance on how to safely use their caffeine e-liquid or caffeinated vaping products. With the potential for misuse, and clear differences in how nicotine and caffeine will affect the body, this is somewhat worrisome. Another question that comes to mind is whether or not it’s safe to vape caffeine. A poster to E-Cigarette Forum noted that at room temperature caffeine is a solid. He speculated that caffeine in vapor form could re-solidify in the nose, throat and sinuses, possibly causing a variety of different health complications. With a lack of of research on the effects of vaping caffeine, it’s hard to say whether or not this is a legitimate concern, or if vaping caffeine is actually safe. But the same questions could be asked vaping standard, non-nicotine based e-liquid. Although there’s certainly a decent amount research available on e-juice, it’s far from conclusive, especially in the long term. But before you get too concerned, it’s important to note that much like nicotine, caffeine is a relatively safe stimulant that’s been used for thousands of years. There are some potential risks associated with it, but it’s never been linked to any serious health complications. It is mildly addictive and overuse will often lead to headaches or nausea, which normally prevents further use. Serious overdoses could cause rapid heartbeat, vomiting, diarrhea, disorientation and possibly seizures, but a toxic dose of caffeine is estimated at about 150 to 200 mg per kg, which works out to about 118 cups of coffee. In vaping terms, it’s virtually impossible to inhale that much caffeine quickly enough for it to have serious effects.